Its high seas and the pirate’s life for us as we set sail with Microgaming and their salty sea crew. Get your sea legs ready as we board the jolly roger, no, wrong ship, we are off on the Skull Duggery, to find our loot and pillage our way through the seven seas. 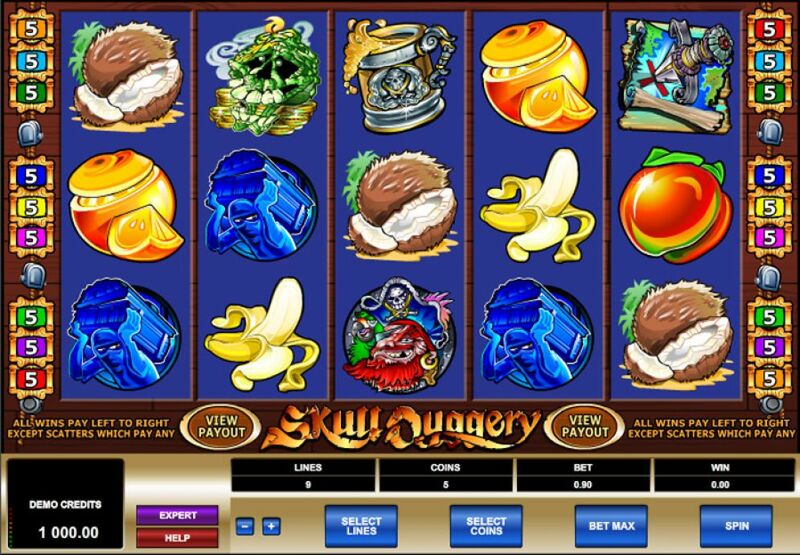 Skull Duggery is a 5-reel, 9 pay line slot with a low RTP of 95.8%, but don’t let that combination put you off. This slot is very popular amongst the online slot players and we are going to tell you why. But first check out the reels themselves, bright, colourful and full of pirate themed icons. Higher value symbols are depicted by the captain, a treasure map and a beer stein. Lower values are replaced with fruits instead of card denominations, so you have the orange, grapes, peach, banana and coconut. In the background you can hear creaking boards, the sea and of course birds and sailors too, all adding to the feel that you are deep in the belly of a pirate ship. Bet Amounts – Betting on Skull Duggery begins at 1p per line in play and can be increased to £5 per line in play. So, if you want to play 1 line or all 9 you can be looking at bets costing from 1p per spin up to the highest of £45 per spin. Make sure you have activated all the pay lines you want in play and amended the coin value and coin amount before hitting spin. Wild Symbol – The Skull Duggery logo is your wild symbol and it will only substitute for the fruit symbols, so be aware of that when it lands. However, don’t be too annoyed as when it does form a winning combination with the fruit, it will triple that win for you. It is also your highest paying symbol too, land yourself 5 of these on an active pay line to bag the booty of a x12,000 coin win. Scatter Symbol – As is the way with pirates, skulls feature a large part in their every day imagery. Skull Duggery has a green skull on a pile of gold as its scatter symbol and although it doesn’t trigger a feature of any kind, it allocates scatter wins to your balance instead. Land yourself 2 or more of these symbols to add an extra win on top of any line wins you achieve. 5 scatter symbols will award a x200 coin win. Bonus Symbol – There is a bonus feature in Skull Duggery though and to trigger it you need to bag a bonus symbol or three. It is depicted by a shadowy pirate creeping off with a treasure chest, so land three or more of these on an active pay line to trigger it. Booty Bonus Feature – Unfortunately the bonus round doesn’t contain extra spins which we know you all love. But, fear not the Booty Bonus Round is still an ocean of treasures waiting to be snagged. The prizes available within the round will be determined by the number of bonus symbols you had when the feature was triggered. 5 bonus symbols will award between x200 to x3,000 coin wins. Now, you will be presented with 5 pirates to choose from, you get to choose one of these to kick off the ship and send them overboard. As they are removed you will receive the cash sum attached to that pirate as your booty. the round will then be over, and you will be returned to the main game to continue play. 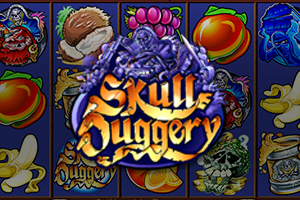 Whether you enjoy the pirate theme or not, Skull Duggery is a fun and fast paced game to play. The RTP is low but with 9 pay lines and such low stake options this is to be expected. It doesn’t actually have as much of a negative impact on the game or wins as you would think though. The Booty Bonus feature triggers regularly and this is a plus as it is so brief with only getting a pick once option. Wins come thick and fast throughout the game, but as with most slots of this nature the more pay lines you have active the better the chances of winning are. Overall an interesting game with a singular feature that actually won us over despite everything screaming at us to run away. Try it for yourself and see, if anything it’s a good gap filler for when you have to get on the train.